Thomas Becket was the most famous archbishop of Canterbury in the Middle Ages, murdered in his cathedral in December 1170, at the instigation of King Henry II. We can tell a great deal about anyone by looking at the books they own. The lecture discusses manuscripts which belonged to Becket himself and what happened to them afterwards. Then it leads to the extraordinary discovery, still unpublished, of his most personal manuscript of all, a psalter which he might actually have been holding when he died. 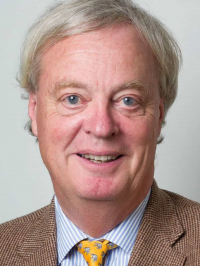 Christopher de Hamel is a Fellow of Corpus Christi College, Cambridge University. He has doctorates from both Oxford and Cambridge, as well as several honorary doctorates. He is a Fellow of the prestigious Society of Antiquaries of London and a member of the Roxburghe Club. For 25 years from 1975 he was responsible for all catalogues and sales of medieval manuscripts at Sotheby's worldwide, and from 2000 to 2016 he was librarian of the Parker Library in Cambridge, one of the finest small collections of medieval books in the world. In 2009, he delivered the Lyell Lectures at Oxford University. He has written many books, including A History of Illuminated Manuscripts, now the standard work on the subject. His most recent book is Meetings with Remarkable Manuscripts (2016), which won the Wolfson History Prize for history written for the general public and the Duff Cooper Prize for best work of history, biography, or political science. 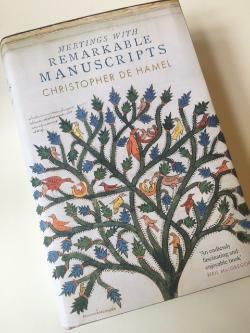 ‌‌Christopher de Hamel's Meeting with Remarkable Manuscripts became an unlikely best-seller on its publication in 2016 (2017 in North America). The lecture will recount highlights of a lifetime of meetings with medieval manuscripts, in Sotheby's salerooms and in the ancient Parker Library in Cambridge, and it will tell how this particular book came to be written. It encourages all would-be historians into a life of delight and adventure in the manuscripts of the Middle Ages.